In today’s society, women - having entered the workplace in growing numbers worldwide - are increasingly expected to earn wages whilst still being primarily responsible for raising children. While all parents confront the tensions of this double burden, for lone mothers, the situation can be especially acute as there is no other adult to share responsibilities and no access to a male wage. * How can governments help without undermining their ability to enter the workforce? 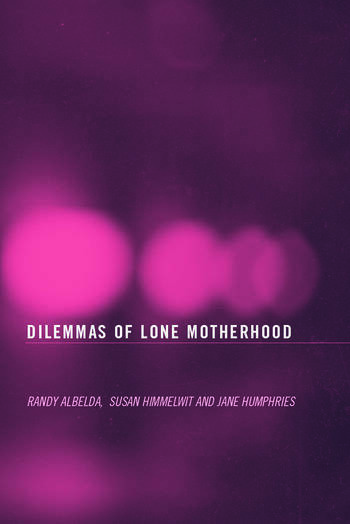 * Should the state indefinitely support lone mothers? * How should we measure the success of a policy? * What roles do ethnicity, race, religion, class and sexual orientation play? The impressive range of contributors to this volume speak from numerous contrasting perspectives. Here they study a variety of international settings such as Sri Lanka, the US, Germany, England and Norway, and in so doing, they allow the reader to draw powerful conclusions by comparing such issues and potential resolutions in varying countries and contexts. This book was previously published as a special issue of Feminist Economics.